The French photographer, Christophe Bricot, did everything right. He pressed the trigger of the camera at exactly the right moment and shot a unique photo. An unparalleled motif was the result. The protagonists: Rider and horse over the obstacle, the sun setting in the background, to the right the impressive Eifel Tower. 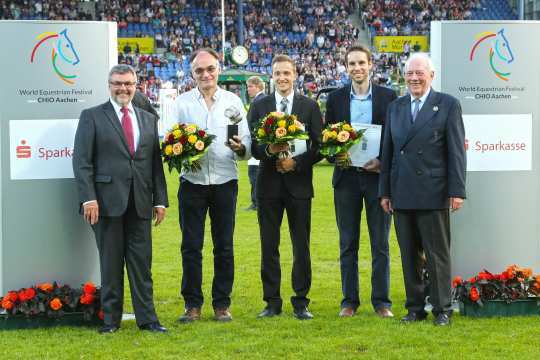 Bricot was distinguished with the media prize, “The Silver Camera” for his piece of photographic art entitled “Lauren Hough riding Ohlala in Paris” in the Main Stadium on Saturday evening (July 16th) after the Final of the Sparkassen-Youngsters-Cup at the CHIO Aachen. The runners-up Daniel Kaiser (GER) for “Just a kiss” and Jeffrey Fierens (BEL) for “Eventing in Arville” (BEL), who came second and third respectively, were also presented with their prizes by Helmut Schiffer, Executive Director of the Rheinischer Sparkassen & Giroverband, and Hans Kauhsen, member of the Supervisory Board of the Aachen-Laurensberger Rennverein e.V. 123 photographers from all over the world had submitted entries to the competition. The renowned media prize is jointly awarded annually by the Aachen-Laurensberger Rennverein e.V., the Sparkasse Aachen and the Rheinischer Sparkassen & Giroverband to the best international equestrian sport photo. The winner receives prize-money to the value of 2,500 Euros, second place is endowed with 1,000 Euros and third place with 500 Euros. Helmut Schiffer, Executive Director of the Rheinischer Sparkassen- & Giroverband (left) and Hans Kauhsen, member of the ALRV Supervisory Board, congratulating the winner Christophe Bricot (2.f.l.). (Photo: CHIO Aachen/Michael Strauch).